Passed away April 5, 2019 at the age of 94. Survived by wife of 28 years, Norma Estela Bruni; children, David (Betty) Bruni, Michael (Nancy) Bruni, Lorraine (Mark) Coccia, Remberto Velez Jr., Linda (Mark) Warner, Beverly McKechnie; 16 grandchildren, 14 great grandchildren; sisters & brother in laws, Mary Jane (John) Napolitano, Evelyn Palermo, Helen (P.J.) Turrie, Carmen Luciano of Tampa FL, Olga (Ruben) Viera, Ronny (Eneida) Estela, & Loretta Estela; & many nieces, nephews, & friends. Many Thanks to Peter & Sandy Sullivan for their support, the staff at St. Bernard's Senior Daycare for taking great care of Michael, Norma's Basement Angels, the palliative care staff at Strong Memorial Hospital, & many friends & family. Michael was a World War II veteran. He worked for Hickey-Freeman Co. for 43 years he retired as a union rep. Calling hours will be held Sunday April 7, from 4-8pm at New Comer Cremations & Funerals, 2636 Ridgeway Ave. Services will be the following day at Our Lady of the Americas (Saint Frances Xavier Cabrini), 864 East Main Street, at 11am burial to follow at Holy Sepulchre Cemetery. 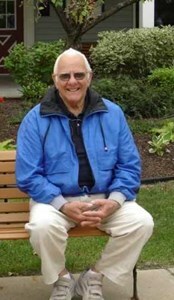 Add your memories to the guest book of Michael Bruni Sr..
Michael was a wonderful man. Wish we could all be as good as he was. God Bless you Michael. Heaven has one of their number one angels.